It's an interesting topic, but suffice to say, I won't go into all that right now. Let's just look at and review this wine. 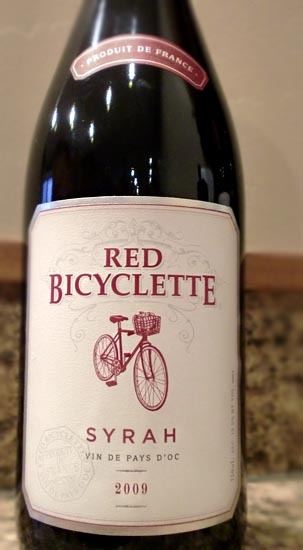 This is the 2009 Red Bicyclette Syrah out of the Languedoc Roussillon region of France. It is produced by Les Caves du Sieur d'Arques and is 100% Syrah. It pours a lusciously dark and inky violet color and has aromas of black cherries and blackberries with some obvious black pepper. Tasting brings a smooth berry-forward mix of cherries, blackberry jam, and hints of Christmas spice and smoke. Tannins are present, but light. While these tasting notes may sound like a dark, powerful combination, this wine is actually pretty mellow and simple. It's basically just an easy-drinking dark berry-centric wine. Is it one of my favorite Syrahs? Nope, but it is a pretty inoffensive dark wine that would be alright for a group of people. I believe it sells for around $8-12 depending on the retailer. Drink This: if you want a dark, dark wine that's easy to drink, if not a touch simple. Don't Drink This: if you're looking for a powerful dark red wine.